VISIONTEK 93 POS - mobile handheld data terminal to capture process and transmit information to host computers in real time. 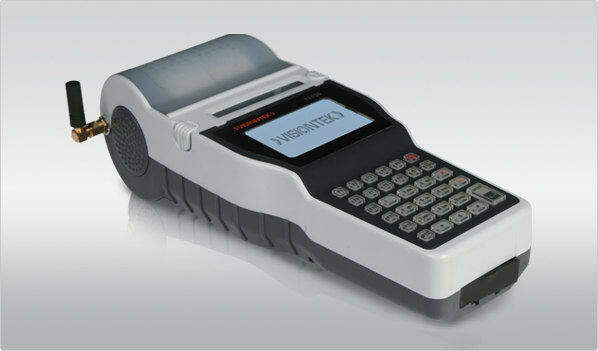 VISIONTEK 93 POS inbuilt impact printer enables you to print transaction receipt instantly. This 93 POS has clear white FSTN LCD display and Keypad with good user interface. The collected data can be uploaded to a remote server via RS-232. VISIONTEK ePOS 9x Application download utility is a windows based program to download the image and application files from PC to ePOS terminals. It is also used to upload the data from ePOS terminal to PC. All the variants of ePOS run on the standard Linux operating system with the requisite set of utilities to deliver its functionality and VISIONTEK SDK simulates ePOS interface for the design of application logic and behaviour.